With the current popularity of low-carb diets, many people seem to believe that carbs will hinder weight loss. 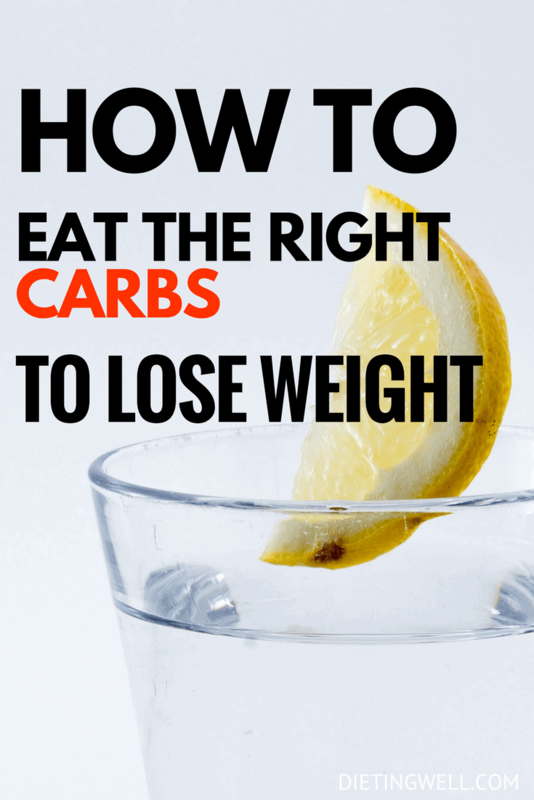 However, if you eat the right carbs in the right amounts, they can actually be very helpful for losing weight. Carbs are an essential part of a healthy, balanced diet, and low-carb diets are often unsustainable in the long run. You shouldn’t be afraid of carbs while on your weight loss journey. Instead, it’s important to understand how carbs work, why your body needs them, and which are the most helpful for losing weight. Carbohydrates are one of the three macronutrients, the other two being fat and protein. Carbs make up starches, sugars, and fibers in fruits, vegetables, and grains. Carbs fuel your central nervous system and provide energy for your muscles. They can be categorized as simple or complex. Simple carbs contain only one or two types of sugar and are easily digested by the body. They tend to provide a quick burst of energy. Complex carbs contain three or more types of sugar and are digested and absorbed more slowly, so they provide a steadier and more moderate energy supply. Carbs are absolutely necessary for survival, and even low-carb diets require that you eat some carbs. The average person needs a minimum of 130 grams of carbs per day to survive, but most people consume much more. Different people will find that they prefer different amounts of carbohydrates. The general recommendation is that carbs make up 45 to 65 percent of your diet. One gram of carbs is 4 calories, so on a 2,000 calorie per day diet, this will be between 225 and 325 grams of carbs. How Does Your Body Process Carbs? After you consume carbohydrates, your body breaks them down into smaller units of sugar that are absorbed by the small intestine. Then, the sugar enters the bloodstream and travels to the liver, which converts them to glucose. Your blood carries the glucose throughout your body to provide it with energy. If you eat more carbs than your body needs in that moment, your body will store about 2,000 calories of carbohydrates in your liver and skeletal muscles as glycogen. This lets your body use carbs as fuel even when you’re sleeping or have gone a few hours without eating. Any excess carbs beyond what’s stored as glycogen will be stored as fat. Do Carbs Help with Weight Loss? Although many popular diets limit carb intake, carbs are necessary for survival and can even help with weight loss when consumed properly. To lose fat, you must burn more calories than you consume. Your body burns calories just by keeping itself alive, and any activity or exercise you do accounts for extra calories burned. Successful diets may focus on limiting or eliminating a food group, but the true reason they’re successful is because they reduce caloric intake. It’s possible to lose weight eating any types of foods as long as there’s a caloric deficit. However, it’s much easier to create a deficit when you eat foods that keep you satiated, provide nutrients, and give you enough energy to be active. Carbs are an essential part of that balance. Carbs are your body’s first source of energy. If increasing your activity is part of your weight loss plan, carbs can give you the energy boost you need. If you don’t eat enough carbohydrates, your body will use protein as fuel, but protein is needed for building muscle. When your body uses it for energy, you’ll lose muscle or have trouble gaining it. Therefore, it’s important to consume enough carbs to maintain or build muscle. Complex and fiber-rich carbs can help you feel full for a long time, too. Fiber takes longer to digest than many other foods, so it can keep you full until your next meal and prevent you from snacking or overeating. Limiting carbs could make your weight loss plan unsustainable. Your diet shouldn’t be a temporary fix. It should be a lifestyle change you feel comfortable following for the rest of your life. For most people, cutting out carbs permanently is just not possible. Drastically changing or limiting your diet when losing weight could cause you to gain weight back when you return to eating normally because you haven’t established balanced and healthy habits. Does It Matter What Time of Day You Eat Carbs? You may hear lots of different pieces of advice on what time of day you should eat carbs. It’s common for people to advise eating carbohydrates earlier in the day, then limiting your carb intake in the afternoon and evening. This is because the meals you eat shortly before you go to sleep tend to elevate your insulin and blood glucose levels longer than meals you eat earlier in the day. One explanation is that your insulin sensitivity gets worse at night. However, another explanation is that your insulin sensitivity is improved in the morning because you’ve fasted overnight. Carbs at night may not actually worsen insulin sensitivity, but carbs in the morning may actually improve it instead. One study followed two groups of people who all consumed the same macronutrient proportions. However, one group ate most of their carbs at night while the other group ate carbs evenly throughout the day. After six months, those eating all their carbs at night lost more weight and reported feeling more satiated than the other group. There are conflicting studies about whether it’s better to eat more carbs in the morning or at night. Some people report feeling hungrier when they wake up after eating a carb-heavy dinner, and others report feeling more satiated. What’s most important for weight loss is creating a caloric deficit, which isn’t affected by what time of day you eat macronutrients. You may have to experiment with different meal plans and find what’s most comfortable for you, but you shouldn’t worry too much about when you eat carbs. What Are the Best Carbs for Exercise? Eating carbs before exercising can give you the energy boost necessary for a successful workout. It’s typically better to eat complex carbs than simple carbs. However, if you need a quick boost right before a workout, simple carbs might be a better option. What Are the Best Carbs for Feeling Full? One way to measure how filling different foods are is the satiety index, which ranks 240-calorie servings of 38 foods. To develop this scale, researchers fed these foods to participants, then allowed them to eat at a buffet two hours later. The researchers questioned the participants about their hunger levels and observed the amount they ate at the buffet to determine how satiating each of the 38 foods is. The satiety index includes fats and proteins, but carbs are some of the most filling foods on the list. Carbs that contain lots of fiber tend to be very filling because they’re digested slowly. When losing weight, choosing satiating foods is important to avoid snacking between meals or overeating during a meal. What Carbs Should You Avoid When Losing Weight? Although there are a wide variety of healthy carbs that help with weight loss, there are also some you should avoid. Try to avoid white bread and choose whole grain bread instead. White bread is made with enriched flour, which doesn’t provide many nutrients and can cause a spike in blood sugar. Whole grain bread provides more protein and fiber and keeps your blood sugar stable. White pasta has the same effect as white bread, but it can be replaced with whole grain pasta. Cakes, pastries, and other baked goods contain lots of refined flour and added sugars. They’re dense in calories, but they won’t keep you full or provide you with much energy. Candy and sugary drinks should also not be a regular part of your diet. Many types of breakfast cereal contain added sugars as well. Before purchasing cereal, check the sugar content on the label and see whether it contains any fiber or protein. You should always choose fresh fruits and vegetables over fruit or vegetable juice. Juicing removes the fiber from the fruit, which makes it much less filling and nutritious, but it leaves all the sugar. It’s okay to have juice, candy, pasta, or baked goods once in a while, even if you’re trying to lose weight. Your weight loss plan should involve creating balanced and sustainable habits that you can maintain for your whole life. Completely depriving yourself of sugary foods or simple carbs may make your diet unsustainable, and it’s better to indulge occasionally while sticking with your plan. However, complex carbs and high-fiber carbs will be the most effective for filling you up and keeping your energized. Thank you so much for this. I loved the success I had in just a short time with the Keto diet, but when I found myself lusting over vegetables in the market, I decided I had to do something different. I hated to admit it, but the key really is satiety and calorie/portion control. (I hate to admit it because so much diet wisdom over the past couple of decades has been about NOT counting calories.) I was confused for a while after I stopped doing Keto, but this article inspires me to get back to what I was doing — good, clean eating, with portion control. Thanks again! Thanks for the helpful post. I am on low carbs diet and this has inspired me to go on doing what I have been doing. Portion control and eating right carbs makes us more healthy and fit.